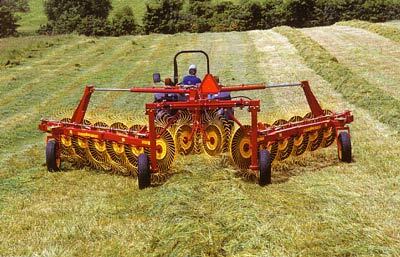 Rapid Tractors are pleased to offer an alternative to powered rakes by re introducing the finger wheel rake. 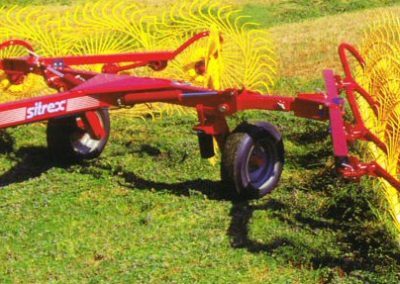 This type of rake has been commonplace on farms for decades and is now available again, although they have been updated and are now more flexible in operation, having options of self steering, hydraulic folding and narrower transport positions. Available in working widths from 6’6” (2m) up to a massive 36’ (11m), the spring loaded ground contour following rake wheels have a diameter of 55” (1.4m) and are made up of 40 spring steel tines of 7mm diameter. They are lifted and lowered mechanically or by hydraulic ram on the larger models and are carried on heavy duty roller bearing stub axles. These rakes are very simple by design, low maintenance and operate at a high speed, all giving a lower purchase and operating cost when compared to a power driven type rake. Not only suitable for rowing up grass but think about straw … with straw at a premium these days, ever wondered about how much is left in the field after baling? After a quick pass over a field with one of our rakes you could soon find a considerable tonnage of extra straw to bale. Rake with very sturdy equipment. Independent and interchangeable wheels mounted on roller bearings. Left and right SPREADING – TURNING and RAKING action, also suitable for limited place. 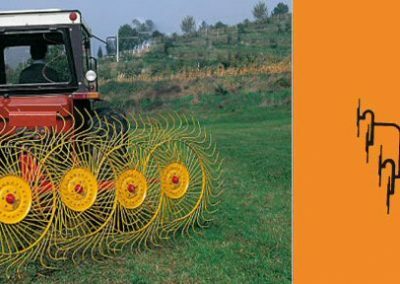 Sitrex Columbia Hay Rake is technically designed to provide a fast and careful raking, while it handles hay gentler than any other ordinary parallel bar rakes. 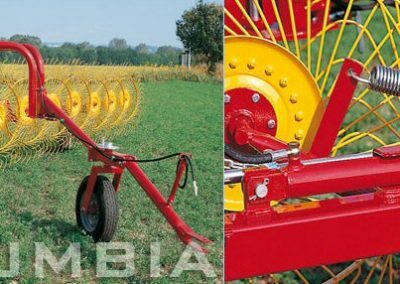 Among its main features, along with gentle handling of hay, Columbia is particularly suitable for rough soils and it is more useful for low crops and for wide windrows at higher speed. The independent spring loaded wheels follow the contours of the ground independently one from the other and from the frame. The new “V” type wheel rakes with 8, 10 or 12 wheels of the QR range give farmers the opportunity to use a machine featuring high performance in terms of both quality and quantity, combined with great simplicity of use. The machine is compact, but designed at the same time with plenty of clearance in the area through which the raked hay goes through. This gives the machine excellent operational qualities as well as manoeuvrability and stability both while working and during transport. Thanks to the quality of the materials used and to the solutions adopted based on experience acquired in innumerable field tests, our QR range wheel rakes will meet farmers’ every need, with regard both to functions and to durability. The Sitrex Magnum Pull-Type Rake is the biggest model of the V-Rake Pull-Type line. These machines are designed to obtain a maximum working width of 36′ (11m) and windrows with variable width from 3′ (.91m) to 6′ (1.8m) Couplings of all various frame components are flexible to obtain the maximum adjustment of the machine on very rough and uneven ground. Moreover, the drawbar and the opening system are mounted over the wheels, this allows to make adjustment of the windrow without affecting the other components of the machine All rake wheels are spring-load and float independently allowing the machine to follow the ground contours. Tines are made of special spring steel with 7 mm diameter making fluffy windrows very suitable for baling. A double acting hydraulic system controls both the lifting of the wheels and machine total or partial opening and closing. Fitted to the hydraulic cylinder which controls the opening and closing of the machine, is mounted a locking valve to maintain the required working width. Even in case of pipe breaking the machine remains in the same position which has been set. Our Magnum line hay rakes rake up the crop quickly and gently, enabling better drying of the hay and an excellent yield. They have rake wheels with a diameter of 55″ (1.4 m), each wheel is equipped with 40 tines made of top quality spring steel. The tines are uniformly spaced and designed to collect all the product, forming a perfectly shaped swathe. The tines can be replaced individually, so as to waste as little time as possible. The hay rakes of the Magnum range are designed in such a way that adjustments are simple to accomplish. A ratchet lever equipped with a locking mechanism enables the width of the swathe to be adjusted easily and rapidly from about 3′ (0.91 m) to about 6′ (1.8 m). The machine can also be equipped with an optional hydraulic device enabling adjustment of the swathe directly from the tractor. Each rake wheel has its own spring enabling the correct pressure on the ground to be obtained separately, optimizing the quality and quantity of the crop. What is more, after this initial adjustment, all the subsequent adjustments are made on the whole wing of the hay rake thanks to a crank operating a shaft to which all the hay rake wheels are connected. This saves a lot of time. For transport, adjustable disk brakes stabilize each of the pivoting wheels, enabling the machine to proceed in the utmost safety with no shimmying during transport. The wide range of machines in the Magnum line covers working widths from about 21’4″ (about 6.5 m) for the machines with 10 rake wheels up to about 31′ (about 9.4 m) for those with 16 rake wheels. Hay rakes need to be solid and tough to adapt to the extreme conditions found in the fields. This means that in addition to all the features already described above, all the wings and the drawbar of these extremely large machines have been fitted with extra reinforcements, making them fully reliable in time in spite of the amount of work they are made to do. In spite of their large size, however, they are easy to handle and flexible, and they can be changed rapidly from the working position to the transport position from the control cab, thanks to a hydraulic system that withdraws the strong cylinders in which the wings end and those that lift the rake wheels. Just like the smaller versions, they are easily parked thanks to the height-adjustable supporting foot.